Air conditioners may look similar, but their Seasonal Energy Efficiency Rating (SEER) can vary widely. Higher SEER numbers save more money spent on electricity. 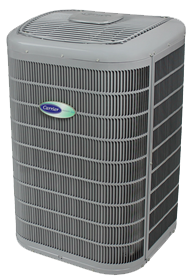 A 13 SEER air conditioner, the EPA "current minimum standard", uses 23% less energy then a 10 SEER unit (EPA standard up until Jan. 2006). Even though 13 SEER is the minimum efficiency available, we currently offer a line of air conditioners that start at 13 SEER and go all the way up to a 21 SEER . Depending on your average usage, higher SEER air conditioners can significantly reduce your electric bill.